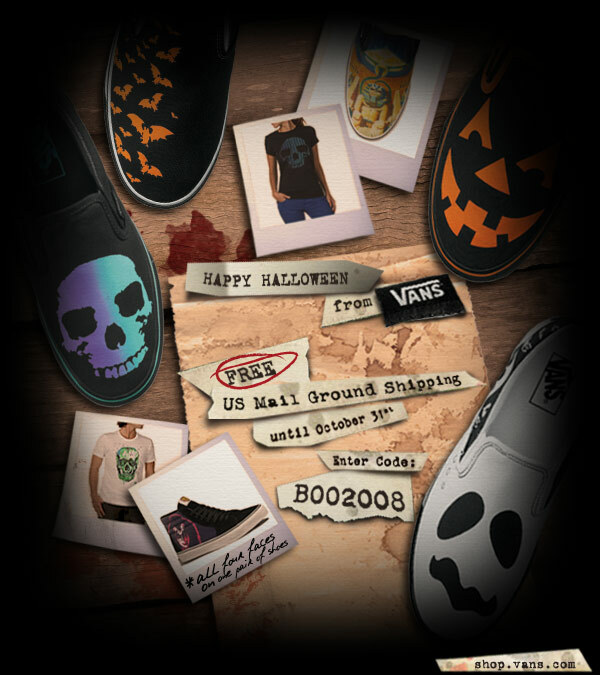 Free US Mail promotion only valid on all in-stock orders (no custom shoes) beginning 12:00am Wednesday, October 22nd 2008 and expiring 11:59pm on Friday, October 31st 2008. No minimum purchase required. Orders will ship out US Mail Ground. First, select "US Mail" as your shipping method. On the payment review page, enter code BOO2008 in the promotional code box and click "apply." Shipping costs should reset to "$0.00." Shipping promotion not valid for APO/fPO addresses or international addresses. You can also learn more about Vans here on Apparel Search.